The Victorian Peeper: Hemophilia Confirmed as Victoria's "Royal Disease"
Hemophilia Confirmed as Victoria's "Royal Disease"
A new analysis has confirmed that the “royal disease” suffered by the male descendants of Queen Victoria was in fact a rare type of hemophilia, the genetic disease marked by a deficiency in blood clotting. The disease spread as the queen's children married into other royal families across Europe. Modern researchers had already hypothesized that the royals suffered from hemophilia, but until now they had lacked definitive evidence. Recent DNA analysis on bones belonging to members of the last Russian royal family, the Romanovs, indicates the disease was indeed hemophilia, a rare subtype known as hemophilia B. The genotyping study was published in the journal Science. 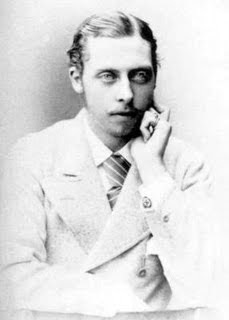 Shown here: Prince Leopold (1853-1884), Duke of Albany, Queen Victoria's youngest son, who suffered from hemophilia.